For biologic transmitters, see transmitter substance. Commercial FM broadcasting transmitter at radio station WDET-FM, Wayne State University, Detroit, USA. It broadcasts at 101.9 MHz with a radiated power of 48 kW. In electronics and telecommunications, a transmitter or radio transmitter is an electronic device which produces radio waves with an antenna. The transmitter itself generates a radio frequency alternating current, which is applied to the antenna. When excited by this alternating current, the antenna radiates radio waves. Transmitters are necessary component parts of all electronic devices that communicate by radio, such as radio and television broadcasting stations, cell phones, walkie-talkies, wireless computer networks, Bluetooth enabled devices, garage door openers, two-way radios in aircraft, ships, spacecraft, radar sets and navigational beacons. The term transmitter is usually limited to equipment that generates radio waves for communication purposes; or radiolocation, such as radar and navigational transmitters. Generators of radio waves for heating or industrial purposes, such as microwave ovens or diathermy equipment, are not usually called transmitters, even though they often have similar circuits. The term is popularly used more specifically to refer to a broadcast transmitter, a transmitter used in broadcasting, as in FM radio transmitter or television transmitter. This usage typically includes both the transmitter proper, the antenna, and often the building it is housed in. Hi my name is Don and I primarily design and test antennas for a living and I'm here today to try to explain to you basically a little bit about how antennas work so the first thing I want to start with is the antenna wire and we call it coaxial cable so the first thing we are going to talk about it what is not coaxial cable this is just normal power cable notice that the lines are parallel to each other this coaxial cable you'll notice that there's a shield on the outside and then there's an insulator and then there's a center conductor, the center conductor is actually what runs the power to the antenna. The reason this is important is how an internal works. So if you have two pieces of wire side-by-side, you have current flow in this direction and current flow in that direction the current flows cancel each other out if you have a piece of coaxial cable this is actually grounded on the outside and the current flows in this direction and the current flows in that direction on the inside and the currents cancel each other out how we gettin intended to work and actually radiate power is to change that so to change that we want to transmit power out to the air so once again you have two pieces of wired and you have current flow in this direction and current flow in that direction a simple dipole antenna like you put on your FM stereo at home is just when you take this wire and split off over in this direction and split it off over this direction and now I still have current flow in this direction and I still have current flow in this direction but if you notice the current flows in the same direction across this plane and that allows us to generate RF energy that leaves like this, and can be received as well. So if you have two pieces of wire side-by-side the electromagnetic energy that is generated from current flow cancel each other out so if I have a wire here and have a wire here, this one we'll call it positive and this one we'll call negative because this was positive in this one's negative you can't get any energy to radiate out because they cancel each other out I think that's pretty simple but if I take and I separate these two wires like this so this is still my feed point down here and I have current flow in this direction and in this direction and I have current flow in this direction and in this direction but every time you have current flow you also have electromagnetic energy so now because I have current flow in the same direction across this plane now I have an energy field that looks like this. I have a high current point here and a low current point here but high voltage point here and when that high voltage point hits they're all that electromagnetic energy jumps off the wire and radiates out into space that's basically how an antenna works, most antennas act very similar to a dipole antenna and that's what this is and remember a dipole antenna you have radiated energy on both sides How does an antenna receive energy? Well like on a cell tower a cell tower is radiating energy just like our antenna here was radiating energy out, well radiated energy also can be received by this same antenna so the antenna captures that energy and then transfers it down to our feed point so we can run into an amplifier or maybe you just plug it straight into your stereo system or on a car stereo you plug it into the back of the car stereo and they all act very similarly. I hope everything that I've explained today was apparent and you understood it and if you have any questions or comments please feel free to leave that and please subscribe to our channel we will be releasing more videos in the future. Have a great day. A radio transmitter is usually part of a radio communication system which uses electromagnetic waves (radio waves) to transport information (in this case sound) over a distance. A transmitter can be a separate piece of electronic equipment, or an electrical circuit within another electronic device. A transmitter and a receiver combined in one unit is called a transceiver. The term transmitter is often abbreviated "XMTR" or "TX" in technical documents. The purpose of most transmitters is radio communication of information over a distance. The information is provided to the transmitter in the form of an electronic signal, such as an audio (sound) signal from a microphone, a video (TV) signal from a video camera, or in wireless networking devices, a digital signal from a computer. The transmitter combines the information signal to be carried with the radio frequency signal which generates the radio waves, which is called the carrier signal. This process is called modulation. The information can be added to the carrier in several different ways, in different types of transmitters. In an amplitude modulation (AM) transmitter, the information is added to the radio signal by varying its amplitude. In a frequency modulation (FM) transmitter, it is added by varying the radio signal's frequency slightly. Many other types of modulation are also used. The radio signal from the transmitter is applied to the antenna, which radiates the energy as radio waves. The antenna may be enclosed inside the case or attached to the outside of the transmitter, as in portable devices such as cell phones, walkie-talkies, and garage door openers. In more powerful transmitters, the antenna may be located on top of a building or on a separate tower, and connected to the transmitter by a feed line, that is a transmission line. Both the handset and the base of a cordless phone contain low power 2.4 GHz radio transmitters to communicate with each other. A garage door opener control contains a low-power 2.4 GHz transmitter that sends coded commands to the garage door mechanism to open or close. In a wireless computer network, wireless routers like this contain a 2.4 GHz transmitter that sends and receives network packets for computers on the local area network. Electromagnetic waves are radiated by electric charges undergoing acceleration. Radio waves, electromagnetic waves of radio frequency, are generated by time-varying electric currents, consisting of electrons flowing through a metal conductor called an antenna which are changing their velocity or direction and thus accelerating. An alternating current flowing back and forth in an antenna will create an oscillating magnetic field around the conductor. The alternating voltage will also charge the ends of the conductor alternately positive and negative, creating an oscillating electric field around the conductor. If the frequency of the oscillations is high enough, in the radio frequency range above about 20 kHz, the oscillating coupled electric and magnetic fields will radiate away from the antenna into space as an electromagnetic wave, a radio wave. A radio transmitter is an electronic circuit which transforms electric power from a power source into a radio frequency alternating current to apply to the antenna, and the antenna radiates the energy from this current as radio waves. The transmitter also impresses information such as an audio or video signal onto the radio frequency current to be carried by the radio waves. When they strike the antenna of a radio receiver, the waves excite similar (but less powerful) radio frequency currents in it. The radio receiver extracts the information from the received waves. A power supply circuit to transform the input electrical power to the higher voltages needed to produce the required power output. An electronic oscillator circuit to generate the radio frequency signal. This usually generates a sine wave of constant amplitude called the carrier wave, because it serves to "carry" the information through space. In most modern transmitters, this is a crystal oscillator in which the frequency is precisely controlled by the vibrations of a quartz crystal. The frequency of the carrier wave is considered the frequency of the transmitter. In an AM (amplitude modulation) transmitter the amplitude (strength) of the carrier wave is varied in proportion to the modulation signal. In an FM (frequency modulation) transmitter the frequency of the carrier is varied by the modulation signal. In an FSK (frequency-shift keying) transmitter, which transmits digital data, the frequency of the carrier is shifted between two frequencies which represent the two binary digits, 0 and 1. An impedance matching (antenna tuner) circuit to match the impedance of the transmitter to the impedance of the antenna (or the transmission line to the antenna), to transfer power efficiently to the antenna. If these impedances are not equal, it causes a condition called standing waves, in which the power is reflected back from the antenna toward the transmitter, wasting power and sometimes overheating the transmitter. In higher frequency transmitters, in the UHF and microwave range, free running oscillators are unstable at the output frequency. Older designs used an oscillator at a lower frequency, which was multiplied by frequency multipliers to get a signal at the desired frequency. Modern designs more commonly use an oscillator at the operating frequency which is stabilized by phase locking to a very stable lower frequency reference, usually a crystal oscillator. In most parts of the world, use of transmitters is strictly controlled by law because of the potential for dangerous interference with other radio transmissions (for example to emergency communications). Transmitters must be licensed by governments, under a variety of license classes depending on use such as broadcast, marine radio, Airband, Amateur and are restricted to certain frequencies and power levels. A body called the International Telecommunications Union (ITU) allocates the frequency bands in the radio spectrum to various classes of users. In some classes, each transmitter is given a unique call sign consisting of a string of letters and numbers which must be used as an identifier in transmissions. The operator of the transmitter usually must hold a government license, such as a general radiotelephone operator license, which is obtained by passing a test demonstrating adequate technical and legal knowledge of safe radio operation. An exception is made allowing the unlicensed use of low-power short-range transmitters in devices such as cell phones, cordless telephones, wireless microphones, walkie-talkies, Wi-Fi and Bluetooth devices, garage door openers, and baby monitors. In the US, these fall under Part 15 of the Federal Communications Commission (FCC) regulations. Although they can be operated without a license, these devices still generally must be type-approved before sale. The first primitive radio transmitters (called spark gap transmitters) were built by German physicist Heinrich Hertz in 1887 during his pioneering investigations of radio waves. These generated radio waves by a high voltage spark between two conductors. Beginning in 1895, Guglielmo Marconi developed the first practical radio communication systems using these transmitters. Spark transmitters couldn't transmit audio (sound) and instead transmitted information by radiotelegraphy, the operator tapped on a telegraph key which turned the transmitter on and off to produce pulses of radio waves spelling out text messages in Morse code. These spark-gap transmitters were used during the first three decades of radio (1887-1917), called the wireless telegraphy or "spark" era. Because they generated damped waves, spark transmitters were electrically "noisy". Their energy was spread over a broad band of frequencies, creating radio noise which interfered with other transmitters. Damped wave emissions were banned by international law in 1934. Two short-lived competing transmitter technologies came into use after the turn of the century, which were the first continuous wave transmitters: the arc converter (Poulsen arc) in 1904 and the Alexanderson alternator around 1910, which were used into the 1920s. All these early technologies were replaced by vacuum tube transmitters in the 1920s, which used the feedback oscillator invented by Edwin Armstrong and Alexander Meissner around 1912, based on the Audion (triode) vacuum tube invented by Lee De Forest in 1906. Vacuum tube transmitters were inexpensive and produced continuous waves, and could be easily modulated to transmit audio (sound) using amplitude modulation (AM). This made AM radio broadcasting possible, which began in about 1920. Practical frequency modulation (FM) transmission was invented by Edwin Armstrong in 1933, who showed that it was less vulnerable to noise and static than AM. The first FM radio station was licensed in 1937. Experimental television transmission had been conducted by radio stations since the late 1920s, but practical television broadcasting didn't begin until the late 1930s. The development of radar during World War II motivated the evolution of high frequency transmitters in the UHF and microwave ranges, using new active devices such as the magnetron, klystron, and traveling wave tube. The invention of the transistor allowed the development in the 1960s of small portable transmitters such as wireless microphones, garage door openers and walkie-talkies. The development of the integrated circuit (IC) in the 1970s made possible the current proliferation of wireless devices, such as cell phones and laptops, in which integrated digital transmitters and receivers in wireless modems operate automatically, in the background, to exchange data with wireless networks. The need to conserve bandwidth in the increasingly congested radio spectrum is driving the development of new types of transmitters such as spread spectrum, trunked radio systems and cognitive radio. A related trend has been an ongoing transition from analog to digital radio transmission methods. Digital modulation can have greater spectral efficiency than analog modulation; that is it can often transmit more information (data rate) in a given bandwidth than analog, using data compression algorithms. Other advantages of digital transmission are increased noise immunity, and greater flexibility and processing power of digital signal processing integrated circuits. 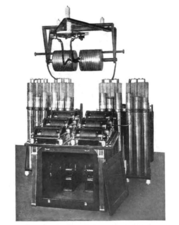 1 MW US Navy Poulsen arc transmitter which generated continuous waves using an electric arc in a magnetic field, a technology used from 1903 until the 1920s. One of the first vacuum tube AM radio transmitters, built by Lee De Forest in 1914. The early Audion (triode) tube is visible at right. Transmitter assembly of a 20 kW, 9.375 GHz air traffic control radar, 1947. The magnetron tube mounted between two magnets (right) produces microwaves which pass from the aperture (left) into a waveguide which conducts them to the dish antenna. ^ Serway, Raymond; Faughn, Jerry; Vuille, Chris (2008). College Physics, 8th Ed. Cengage Learning. p. 714. ISBN 0495386936. ^ a b Ellingson, Steven W. (2016). Radio Systems Engineering. Cambridge University Press. pp. 16–17. ISBN 1316785165. Major UK television transmitters including change of group information, see Transmitter Planning section.